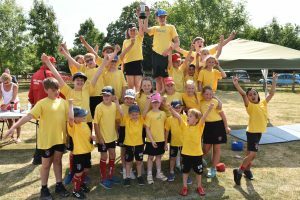 Ghyll Royd School and Pre-School hosted its annual Sports Day at Greystone Manor on Friday 6th July. The sun was shining for another day and football fever was in the air. 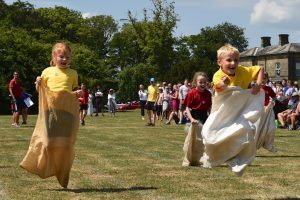 Due to the hot conditions, Sports Day was split over two days this year with the high jump, long jump, shot put and javelin rounds taking place on Thursday morning for Key Stage Two pupils and the relays and races taking place for all years on Friday afternoon. Parents arrived at Greystone Manor to sit out and watch the races unfold. On the Thursday, we had some fantastic results. The high jump whittled down to an all-girls final with Verity taking first place, Phoebe R taking second and Jemima and Juliet in joint third position. In the shot put and javelin, Form 3 pupil Lucy came in first place against pupils three years older than her! The Friday races are always great fun. We rolled out the large water containers filled with ice, we rubbed in our sun cream and sat under the gazebos cheering on one another. The event was a huge success with lots of eager athletes taking part in sprints, relays, sack races and obstacle courses. Our Early Years department with children aged 2-4 years old joined in with egg and spoon races and a hurdles sprint. They were brilliant! The parent races rounded off the day with Mr Ayaz winning the dads race for a second year running and Miss Foster sprinting ahead of the mums into first place. After a long, sunny afternoon, it was only fair that the children and spectating parents and grandparents enjoyed a cool down with a Yorkshire Dales ice-cream courtesy of Billy Bob’s Ice Cream Parlour – thank you for coming down to see us! And for the moment you’ve been waiting for…the overall winners of this year’s Sports Day were…*drum roll*…Drake! The yellow house burst into cheers and applause as they went up to the podium to collect their trophy. Well done to each and every pupil for the effort displayed and the teamwork shown during Sports Day! View a full album of the day’s events on the Ghyll Royd Facebook page.